No, not together. Separately. Although I was tempted to throw some kale into my breakfast. Next time! On Saturday I had a huge craving for foods that make me feel good. What I eat affects my entire body, and it probably does for everyone but I don’t think everyone realizes that. 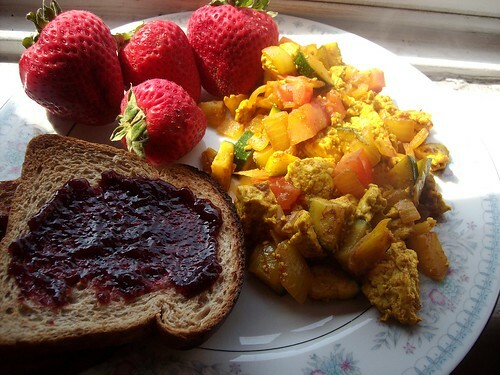 I made myself scrambled tofu for breakfast, and I’m not including the recipe because I really don’t have one. I’ll pick whatever vegetables I have around (this time it was zucchini, onion and tomato) and add in spices (turmeric, cumin, paprika, sage…salt, I can’t remember what else) and then crumble in tofu and cook it all up. Oh and a couple of dashes of hot sauce. Don’t tell Bret, but I think my scrambled tofu is better than his. Maybe I’ll make it for him and see what he thinks. So that was breakfast. Lunch was pretty uneventful, but I had some ideas for dinner. My town’s Farmer’s Market started just recently, and I was able to stop there after work on Thursday. I got really excited and bought a lot. My prized purchase was a big bunch of kale. I love kale, and I told the guy I bought it from how much I love kale. He loves kale too. I wanted to keep it pretty simple so I chopped it up, getting rid of the stems and parboiled it in salted water for about ten minutes or so. I drained it once it had softened up a bit and set it aside while I cooked up some onion and garlic. 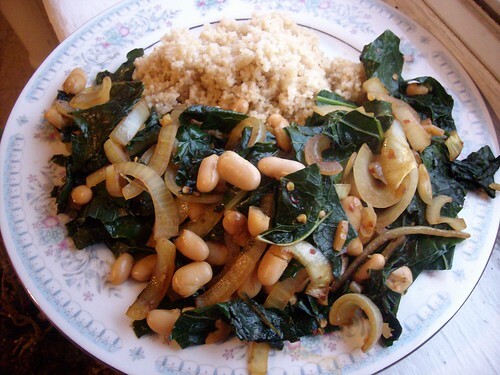 Then I added the kale to the pan with the onion and garlic, added in some white beans, ginger juice, tamari and some crushed red pepper. And it was very tasty with some whole wheat couscous. See! I definitely have a kale supplier for the summer. I’ll be making this again! 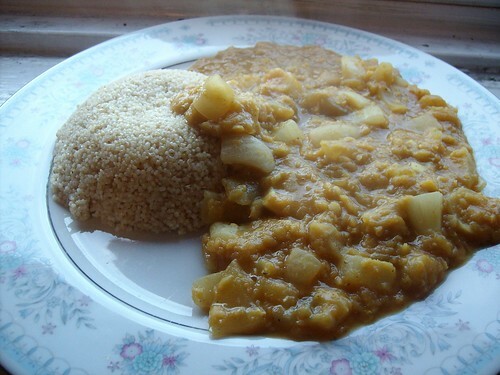 Okay, so I’m thinking this ended up being a cross between a curry and a daal. It had curry type ingredients but the split lentils made it all creamy like daal. Either way, it was really good. So, Bret took me to Wegmans the first time I went out there to visit him. Wegmans was the only fond memory I have from my college time in Geneseo. Well, that’s not true. But it’s a very fond memory and I wish they would spread to the Saratoga area but the Golubs have a tight hold on the area with their crappy Price Choppers. Whatever! Anyway, while we were there I picked up things that I’ve had a hard time finding around here. One of those things was a big bag of split red lentils. But that bag’s been sitting in my kitchen cupboards ever since I bought it. I’m trying to use things that I have hanging around. So I decided on the lentils. I looked through recipes trying to get ideas and settled on making a curry with the lentils. And an eggplant. So here’s what I did. Cook the onion and garlic in a little oil or nonstick cooking spray until it’s soft. This is gonna take a rather large pan to fit everything. Once the onions and garlic are cooked, add the water or broth, lentils, curry paste and eggplant. Bring all of that to a boil, then let it simmer uncovered until the lentils are soft and mushy. Stir it around pretty often to make sure that nothing’s sticking and add more water if you need to. I probably didn’t need to, but I did, and I think that’s why it came out a little more like daal than anything else. Taste it and add seasonings if you need to. I added some salt, a bit of curry powder, and a couple of shakes of cayenne. Once the lentils are cooked and everything’s seasoned, add in the coconut milk and let it boil for about five minutes or so to thicken up. I ate it with a little bit of whole wheat couscous, but I could have eaten it out of a bowl with nothing to accompany it. This makes a bunch, you could totally feed 4 – 6 people no problem. Bret says he wants to learn how to make better curries and I doubt this helped him any but I think he’s pretty good at it already. So, Vegan with a Vengeance is my favorite cookbook. I’ve cooked a crapload of recipes out of it and intend to cook a crapload more. I’ve been wanting to cook this recipe for awhile and finally got around to it. Ta-daa! Yes, that’s marmalade-sized zest. It made it a little chunky, but still plenty good. I gave a bunch away, and ate one last night, one for breakfast, and I plan on eating the last one when I get home from work. Super-yum. I didn’t really know anything at all about scones until I got this cookbook and now they’re one of my favorite things to make for people I like. Ellen came to visit me over the weekend and I knew if I didn’t have food waiting for her she would punch me in the mouth. 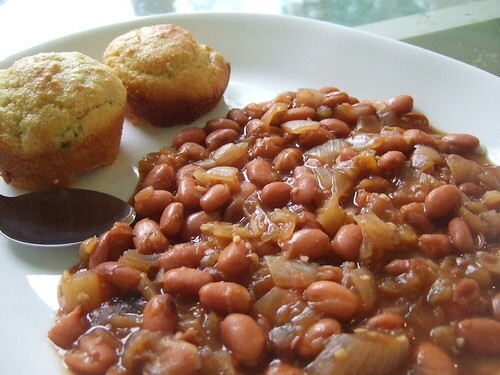 I wandered around the internets for awhile looking at recipes for inspiration and feeling out my own hungries for ideas, and decided that I wanted something that involved beans and barbecue sauce. Apparently in this country they call that “baked beans.” Oh and putting pineapple in there seemed like a good idea too, so I did that. Directions? Oh! Just dump all that stuff into a kettle and cook it for a long while or put it in a pan and bake it for awhile or put it in a crock pot and let it cook for a good long time. That was easy! So, since that’s so simple you can make something else. Buy some cornbread mix and make cornbread muffins. Fold in one jalapeno and make it a little spicy. Yum! Now Ellen won’t punch you in the face when she gets here! So I have nothing to blame my lack of posts on but complete laziness. I’ve been cooking and eating, but not posting. So it’s time to catch up. Last week I was feeling like I should cook with things in my cabinets that I don’t touch as often as I should. I settled on the almost full bag of quinoa that I had sitting around. I really like quinoa. But I hardly ever find myself in the mood to cook with it, or hardly ever find recipes that use it. 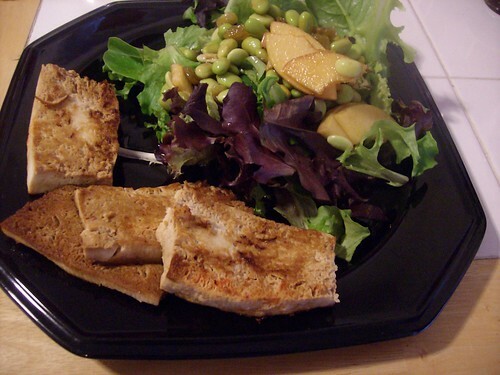 But I think I’m going to use it more often, because it is a great source of protein and fiber. 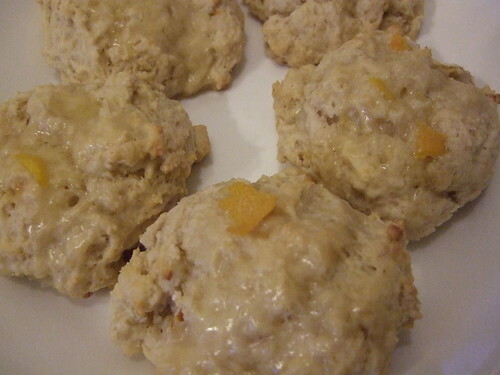 I based my recipe on a Weight Watcher’s recipe. Before anyone stops reading, I’ve cooked Weight Watchers food for people before with no complaints. I mean, diet-ish food doesn’t have to be chicken marinated in fat free salad dressing or whatever silly things people eat. Bring the water and salt to a boil and add the quinoa. Lower the heat and let it simmer for about fifteen minutes or so. Drain off any leftover water if there is any. 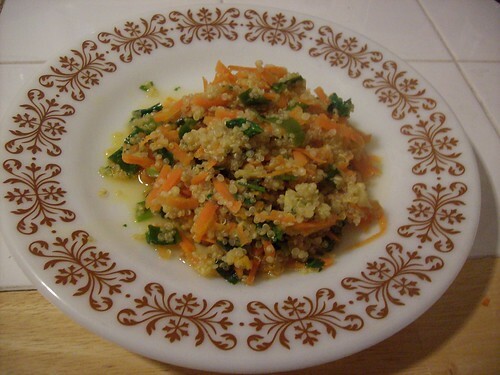 While the quinoa’s cooking, heat the olive oil in a pan and add the carrots, ginger and scallions. Cook them for a minute or so, just to soften up the carrots a bit. Add in the quinoa and mix it all up. Add in the pineapple juice and the cilantro and transfer to a bowl. Eat it right then and there or let it sit in the fridge to get cold! I got four good sized servings out of it. And I added more than 1/3 cup of cilantro I think, I didn’t really measure. So add less if you’re one of those weirdos that doesn’t like cilantro that much. The original recipe called for orange juice, but I didn’t have oranges and had leftover pineapple juice from drinks that I had made. So, use whatever juice you want! Remember how I said I had money now and I was going to start cooking nice things and not just living on Big Lots’ jars of pickles and whatever I’ve had in the cupboard for the last year collecting dust? Okay, that didn’t really happen. I’m in a money squeeze, who knows when I’ll get out, and I haven’t been doing the best job of assembling real meals for myself. Lunch was shredded wheat and milk. Breakfast was shredded wheat and milk. Hmm. 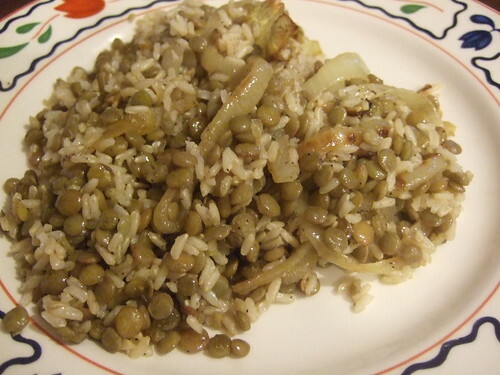 But I have this bag of lentils, and Jeff won’t mind if I steal one of his onions, and oh I have some brown rice too. Holy crap! I can make mujadarrah! I discovered this recipe a long time back when I was in a similar low-budget situation with some random ingredients hanging around. Now, I don’t know if the way I make it resembles at all the authentic proper way of making it, but it tastes awesome. I’m not going to give you a proper recipe because I was just winging it and there’s only a few ingredients but here’s what I did. I cooked a cup of brown rice and boiled a cup of lentils. In another pan I used some olive oil to fry up a whole sliced onion. Now, if I had it to do over again I’d use two. I cooked them until they were good and brown and some of the onions were even burnt a little. Then I took the rice and the lentils, put it in the skillet with the onions, and mixed it all up while still frying it on medium heat. I added a little more oil at the end, stirred it, and then seasoned it with salt and pepper to taste. Whoops! I forgot the garlic. I added in a couple cloves of minced garlic at the end here and fried it for another minute to let that cook a little bit, but I probably should have added it towards the beginning after the onions were translucent. Hey! That was easy! And it was really tasty too. Some recipes add in spices at the end like cumin. I thought about it and thought it tasted just great without. Oh hey. Remember me? I write food blog posts. Well, I finally have some money again and I want to get back into cooking tasty and healthy things that haven’t been collecting dust in my cupboard for a few months, so ta-daa. Roasted veggies! Whoops. That’s a little blurry. Ellen gave me this idea. I had all sorts of asparagus in my fridge from some pasta that Ellen made and I had a head of cauliflower since my grandma likes to give me food and this is what she gave me when she visited. So Ellen told me how to roast vegetables which I’d done once before with brussel sprouts but had forgotten and away I went. 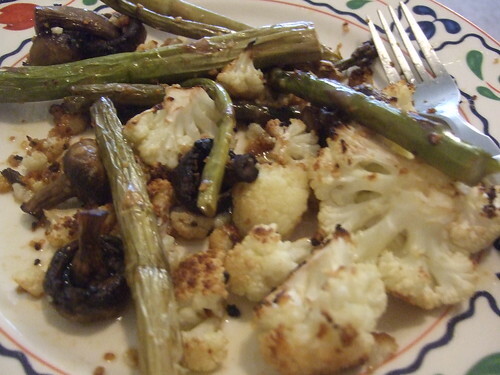 I got a roasting pan, threw in some cauliflower, some asparagus, and some mushrooms. I sprinkled olive oil, lemon juice, salt, black pepper, and garlic on top. Then I put it in the oven at 450° for 40 minutes. It was really, really good. Roasting vegetables brings out some really good flavor that you otherwise may not meet.